using one vessel to make beer. Coffee & Raisins; or, I can feel it in my Plums. Why is my Mash pH so High? Another solid beer from my silly little system. Honesty, after 24 drinkable, decent beers – some better than others, but all just fine – I don’t consider this an ‘experiment’ anymore. 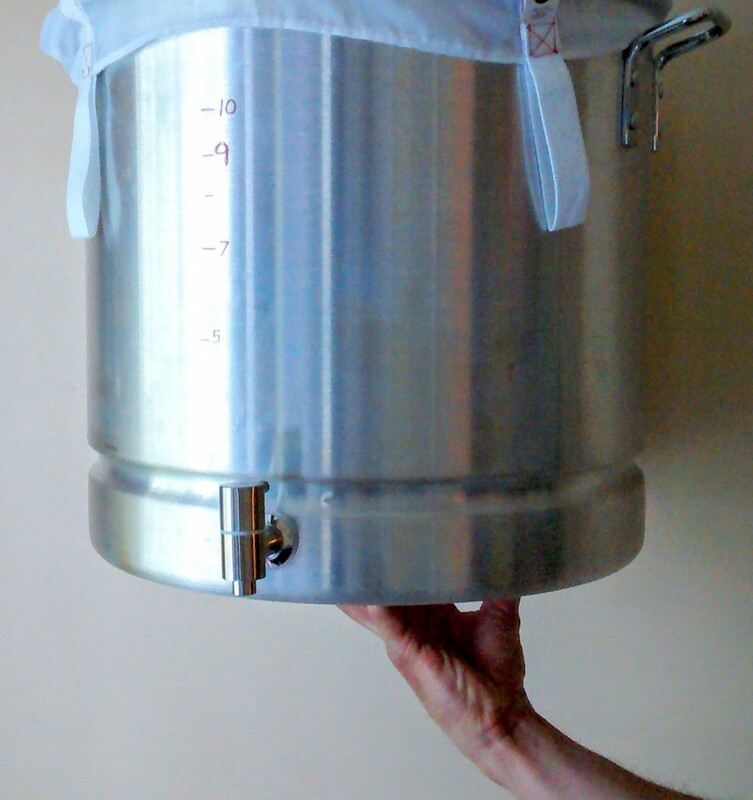 One Pot Brewing is a way to make good beers fast and easy. Anyway, the idea for this particular beer was really simple: a nice Beglian Tripel with a little Centenial dry hop character. And that’s pretty much it. It’s not the best beer I’ve had, and improvements could be made, but I enjoyed drinking it. And yes, it’s gone, so I have to remember what it tasted like. At first I thought it had a touch of cider, possibly due to stressing the yeast, and there might be some truth to that, but I think I was confusing that with a slight tinge from the hops – something I’m not used to tasting in a Tripel. When it comes to the yeast, I took advice from Gordon Strong’s Modern Homebrew Recipes, a book I’ve been getting a lot of recipes from lately. He says to use a Beglian Strong Ale yeast, as opposed to the traditional Monastery or Abbey yeast for a Tripel. Based on this beer I would have to disagree. The yeast is too subdued. This recipe is purely from memory. I went into my garage today and realized I had erased the recipe from my white board. Yeah, I’m getting sloppy, but that’s my style, so whatever. I’m two batches ahead right now, so this beer is dead to me. I’m pretty sure I did a 30 minute mash, 30 minute boil (or less), no aeration before pitching, no starter, and the partial chill method (using a wort chiller to get to about 110 degrees or so). My next beer with showcase a new method for me: the ‘vitality’ starter method. Stay tuned. Looks and sounds great! I’d maybe substitute some Belgian Candy Sugar instead of the corn sugar! I need to make a Tripel again! Probably my favorite style of beer! I don’t believe in Belgian Candy Sugar, I think it’s a scam. In other words, from what I gather from the book “Brew Like a Monk,” I don’t think a belgian brewer would use the stuff. Having said that, I would probably use it in a dark belgian beer or quad. Also, just based on experience, the best Belgian Tripel I ever laid my lips on (Tibbs Brewing, Kalamazoo) – uses plain old Cane Sugar from the grocery store. Depends on what you want, I suppose.